This summer Bristol’s floating seed garden in Castle Park will come to life for the final time with a programme of talks, music and special guests to mark Bristol’s Year of Learning. 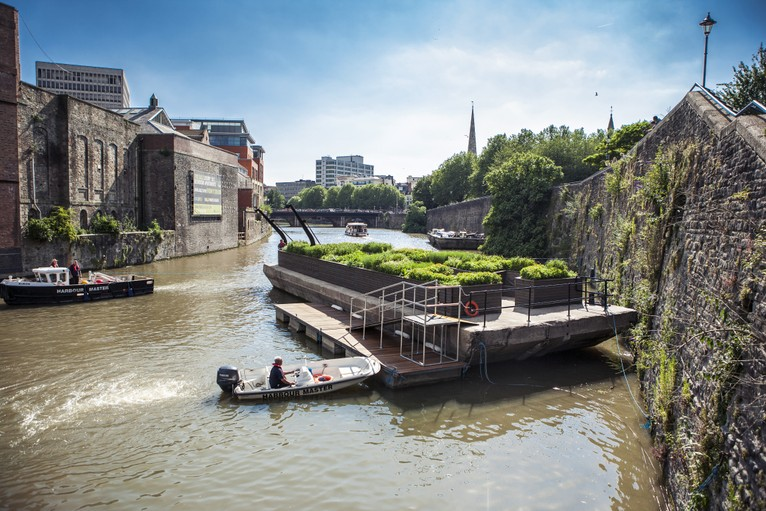 Officially titled Seeds of Change: A Floating Ballast Seed Garden, the space is a piece of public artwork created by Brazilian artist Maria Thereza Alves which hosts summer events curated by the Arnolfini. From June – September boat trips leaving from the Arnolfini will take people to the special events, giving participants the chance to experience Bristol from a different angle. All the plants that feature in the garden are ballast plants – previously non-native species that have become naturalised over time and are now native species. These include fig, rocket, marigold, and the dramatic squirting cucumber. This year’s focus is on learning from each other and the events will explore the work of staff, researchers and volunteers from the Arnolfini and the University of Bristol teaching staff. Speakers include multi award winning horticulturalist Jekka McVicar, who will talk about the plants growing on the Ballast Seed Garden, and artist Tania Kovats, who once moved an entire wildflower meadow across Britain on a canal boat. There will be a special live acoustic set from the band Three Cane Whale. The events all have a learning theme to celebrate the fact that Bristol has become England’s first UNESCO Learning City. Partners representing learning providers, organisations and businesses from across the city are working together to promote the value of learning and increase opportunities for everyone. There will be events for all the family including a tea party with artist Heather Morison of Heather and Ivan Morison, who are currently designing a sensory garden for a special school in Bristol, and the opportunity to hear more about the diverse ecology of Bristol’s Harbour from ecologist Andy Radford. For foodies, there will be a chance to sample special ice cream flavours, made by artists Cooking Sections, inspired by plants growing in the floating garden. Each year the garden is replanted with a different plant composition in an array designed by Nick Wray, plant curator at the University of Bristol Botanic Garden. For more information about the events and to book, contact the Arnolfini Box Office on +44 (0)117 917 2300. The programme is also supported by Arts Council England.